(CNN) -- Inter Milan claimed their fourth successive Scudetto on Saturday night without kicking a ball, after AC Milan were beaten 2-1 by Udinese. 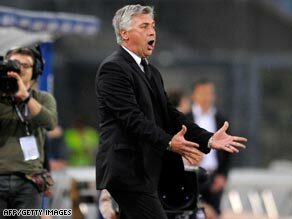 AC MIlan coach Carlos Ancelotti shows his frustration as his side's title hopes end with defeat at Udinese. The Rossoneri began the day seven points behind the Serie A leaders and needed at least a draw to keep alive their slims hopes of taking the trophy from their city rivals. But Udinese proved too strong at their Stadio Friuli and defeat means Carlo Ancelotti's men can no longer catch Inter at the top of the table. Inter host Siena on Sunday evening, but knew they would be champions if Milan lost in Udine. The Nerazzurri had one hand on the title when Gaetano D'Agostino fired Udinese in front from the penalty spot after 31 minutes. Cristian Zapata then added another, four minutes after the interval, and although Milan battled hard to get back into the game, Massimo Ambrosini's last-minute goal came too late for the visitors. The result means Inter maintain their seven-point lead over Milan, who only have two matches left. Inter's title triumph comes in the first year of Jose Mourinho's tenure with the club. The former Chelsea manager joined Inter last summer, replacing Roberto Mancini. Speaking before the title was confirmed, Mourinho told Press Association Sport: "If it happens I will be proud because it's not easy to win something after only one year leading a team. "It has happened to me in both England and Italy and this is obviously a reason to be proud." Meanwhile, veteran Inter Milan midfielder Luis Figo has announced that he will retire at the end of the season. "I finish in the best possible way," Figo told Portuguese sports newspaper Abola. "I will no longer play at a high level." Figo, 36, won four Primera Liga title in spells with Barcelona and Real Madrid before joining Inter in the summer of 2005. "This is a first for me," he added. "I've never won a title without playing. It's always difficult to win a league title in Italy. But with respect to the previous Serie A titles, this one feels different because it has been slightly more difficult." In Saturday's other fixture, Christian Panucci's last-gasp strike earned Roma a 4-3 win over Catania in a thrilling encounter. Catania midfielder Giacomo Tedesco cancelled out Simone Perotta's opener, but Roma then took control with further goals from Mirko Vucinic and Perrotta before the break. The visitors again levelled matters in the second half with efforts from Giuseppe Mascara and Takayuki Morimoto, and a draw seemed to be on the cards until Panucci struck in the dying seconds. The win sees Roma consolidate sixth place in the standings, three points ahead of Udinese, in the battle for the final Europa League spot. Meanwhile, Juventus were held to a 2-2 home draw by Atalanta on Sunday to extend their run without a win to seven matches. Third placed Juve are now only one point ahead of Fiorentina and in danger of missing out on automatic qualification to the Champions League group stages next season. Only the top three in Italy earn that honor while the fourth placed finisher must negotiate two qualifying rounds to make it to the group stages. Fiorentina's 1-0 home win over Sampdoria was their sixth win in seven matches and during that period they have made up 12 points on Juve. At the bottom Sergio Volpi scored a crucial injury time winner as Bologna beat Lecce 2-1 at home to boost their survival hopes and virtually condemn their visitors to Serie B.
Lecce are now bottom and five points from safety following Torino's 2-1 win at Napoli, meaning they will need a miracle to survive. Second bottom Reggina beat Cagliari 2-1 but remain four points behind Torino. The final relegation position looks likely to be between Bologna and Torino, who are separated by one point, Torino are ahead but Bologna have the better head to head record.